The haunted wood : Soviet espionage in America--the Stalin era · One Book. One Author. One Hour. Notes on front endpapers and flysheet. Leon Trotsky, Trotskyists, Trotskyites, Hut zeit--recalled in 1938-“people's enemy,” Akhmerov, Earl Browder, Kim Philby. Red Spy Queen, p. 108 Bentley--identified 41, Soviet agent for FBI ordered “liquidation.” 1955-Soviets continue to search. 2 dozen visits. Payments to Russian Foreign Intelligence Service “You know too much.” Laurence Duggar--Dec 20, 1948--jumps to death (p 21). Why did the Russians shut down the archivists. Paid informers--worked for defense industry p 29. Believers--worked for bureaucracy. Zero/worked for Wye committee/ Jews. What was the VENONA program p 291. Browder--1933-1945--Head of CPUSA. J. Robert Oppenheimer p 184--secret member of compatriot group? What were Enormoz and X4 Line. Who was Samuel Dickstein-“crook” and when did his story become public? What was a talent-spotter. From what you've learned was HUAC necessary? What was HUAC. How does Joe McCarthy look in retrospect. Who is still alive of all characters in book. Notes/Underlinings: SVR--Russian Foreign Intelligence Service. “Sanctum of Secrets,” book exposes Soviet espionage in US, the players, what they stole, how they recruited. Moscow used legal for agents tied to diplomatic corps, illegal for those outside diplomatic/journalistic cover. Alger Hiss, Trotsky, Diego Rivera, Whittaker Chambers, Laurence Duggan, Armand Hammer, Magnate, Zero, Itzhak Akhmerov, Harold Ware, Harry Dexter White, George Silverman, Henry Julian Wadleigh, Whites/monarchists, Hearst pro-Nazi, Nye Committee, . 1934 Soviet intelligence directives. Martha Dodd, Ambassador's daughter, spy for Soviets, recruited husband Alfred Stern and brother William Dodd. Michael Strait. Nazi-Soviet Pact. Elizabeth Bentley, Jacob Golos. Juliette Stuart Poyntz murdered. Defections. Boris Morros--double agent. Congressman Samuel Dickstein--paid for information by Soviets, money for election. Jack Soble, Myra Soble, Jacob Alben indicted for espionage. Harry Gold/Julius Rosenberg. 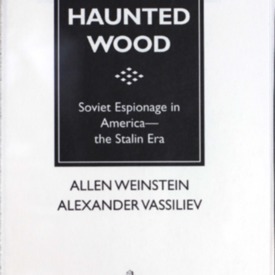 Weinstein, Allen, “The haunted wood : Soviet espionage in America--the Stalin era,” One Book. One Author. One Hour., accessed April 21, 2019, http://booknotes.gmu.edu/items/show/426. Based upon Previously Secret KGB records, The Haunted Wood reveals for the first time the riveting story of Soviet espionage's golden age" in the United States throughout the 1930s, World War II, and the early Cold War. Historian Allen Weinstein, author of Perjury: The Hiss-Chambers Case, and Alexander Vassiliev, a former KGB agent-turned-journalist, were provided unique access to thousands of classified Soviet intelligence dispatches that documented the KGB's success in acquiring America's most valuable atomic, military, and diplomatic secrets. The Haunted Wood narrates the triumphs and failures of Soviet operatives and their American agents during the 1930s and 1940s, describing as well the compelling human dramas involved." "Several chapters provide major new accounts from Moscow's own record of its relations with Alger Hiss and atomic spies Klaus Fuchs, Harry Gold, David Greenglass, Theodore Hall, and Julius Rosenberg, among others, along with fresh information on Soviet espionage in the United States by British agents for the Kremlin - Guy Burgess, Donald Maclean, and Harold "Kim" Philby." --BOOK JACKET.